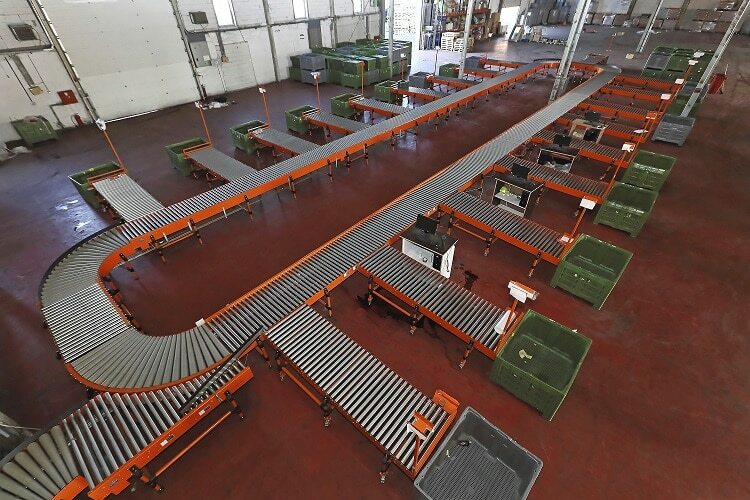 Sortation conveyors are used to direct products from one conveyor line to another. These conveyors integrate an induction system, system merges, and sortation diverts. These are tailored to each operation in order to properly identify, track and transport products to expedite the order fulfillment process. These conveyors are best suited for high throughput operations that require products to flow to numerous locations. Sortation conveyors help increase productivity while saving on labor. There are a variety of sortation technologies used in today’s distribution centers. The type of sorter which is ideal for your application will depend on the size and weight of your product and the required throughput. Shoe sorter support products on tubes or slats, and a “shoe” positively diverts product to either side of the sorter by sliding across the tubes or slats. These high speed sorters can exceed rates of over 250 cartons per minute. Shoe sorter conveyors offer quick and smooth product sortation. 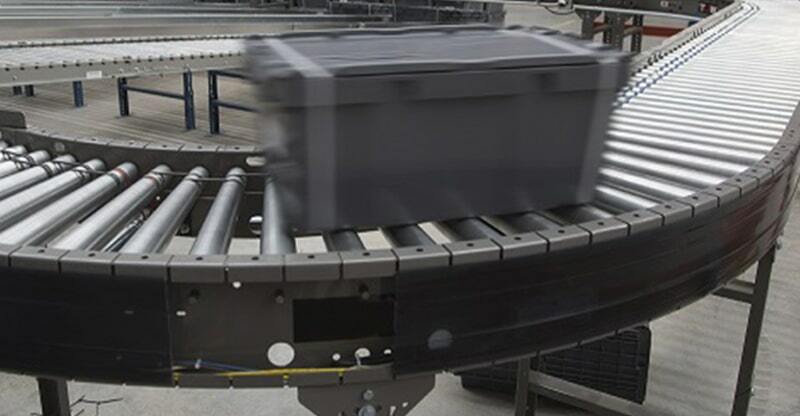 Due to this smooth, gentle sortation, these conveyors are ideal for sorting fragile product. It is also ideal for operations in which products vary in size and weight. Pop-wheel conveyors utilize a belt conveyor with added rows of angled wheels at divert areas. These wheels pop-up in order to direct each load to its required route. Pop-up-wheel sorters provides sorter lengths that are unlimited, with rates that can exceed 80 cartons per minute. Since good friction between the product and wheels is required, carton quality and product type must be factored when considering this technology. A right-angle transfer conveyor provides high throughput for operations requiring product transfer and divert. This type of conveyor utilizes a transfer head to push the product off a conveyor onto a perpendicular or parallel conveyor. Right angle transfer conveyors are ideal for pallet applications, transfer of product onto non-power conveyor and transfer of product onto parallel conveyors when only one device is desired. Pusher sortation conveyors divert products onto chutes that are 90-degrees from the sorting conveyor at rates up to 120 items per minute. Pusher conveyors often utilize a modular plastic belt with a pusher mechanism. 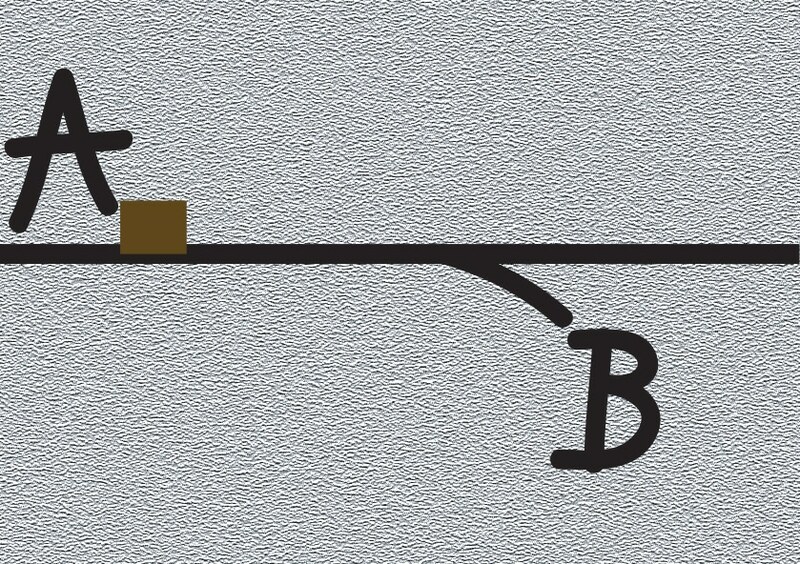 As the product moves in front of the divert lane, the pusher extends to quickly send the product down the desired divert lane. Pusher sortation conveyors are ideal for sorting small, irregular shaped items that can be difficult to transport on other types of sortation conveyors, for example, cosmetics and pharmaceuticals. The narrow belt sorter is designed with multiple narrow belts that transport product. Once the product reaches the divert point, wheels rise up between the belts to accurately move product at a 30 to 90-degree angle down the divert lane. 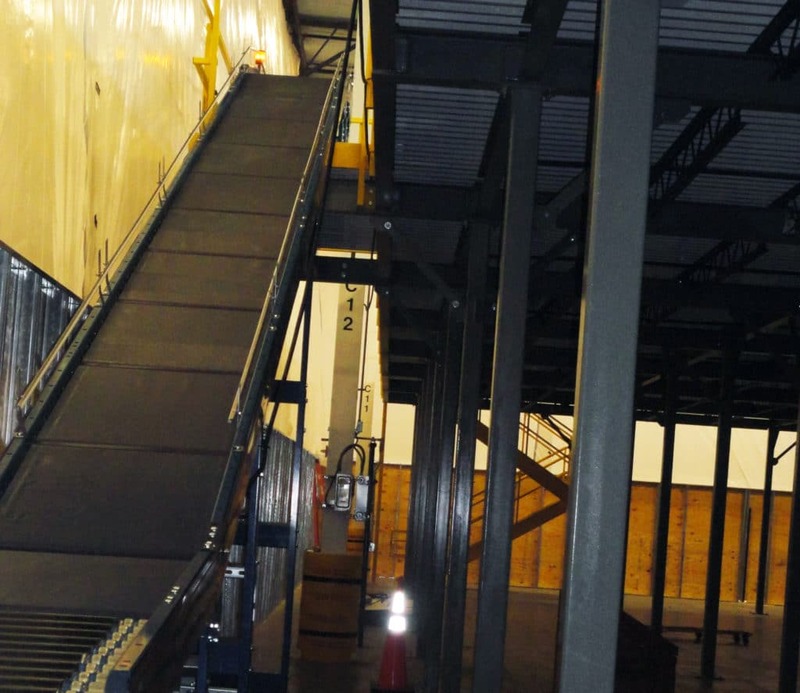 These sortation conveyors can transport products at speeds up to 300 feet per minute. 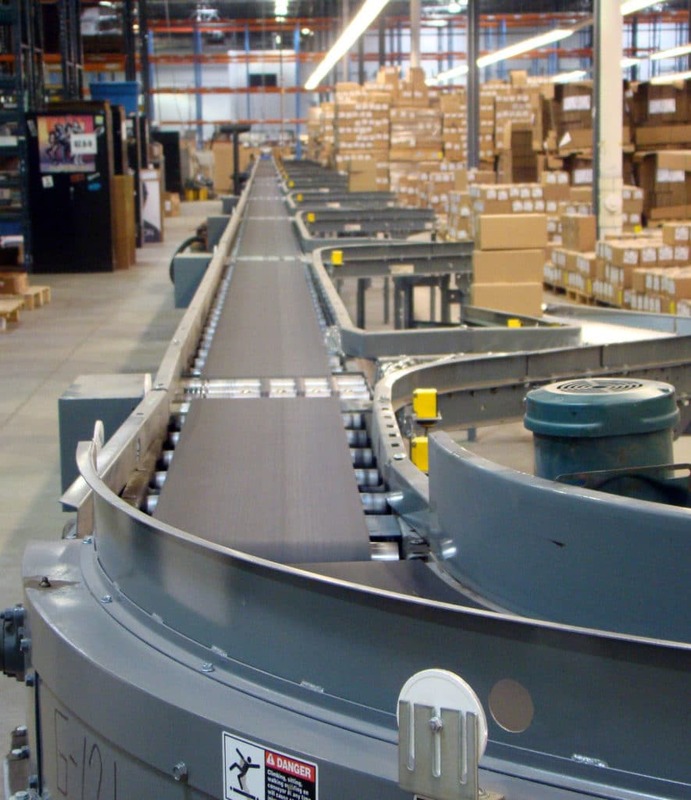 Narrow belt sortation conveyors are ideal for transferring small to medium-size items, such as cartons and totes, to multiple points within the distribution center. The tilt tray sorter (also referred to as a loop sorter) is a high speed, continuous loop conveyor that sorts a variety of mixed shaped and sized items at the same time. These conveyors utilize a tilting a tray at divert points to slide each item onto an appropriate chute. Tilt tray sorters expedite the order fulfillment process by consolidating product orders for shipment and process returned products. They are ideal for items that are able to flow off the tray by gravity such as totes and cartons. 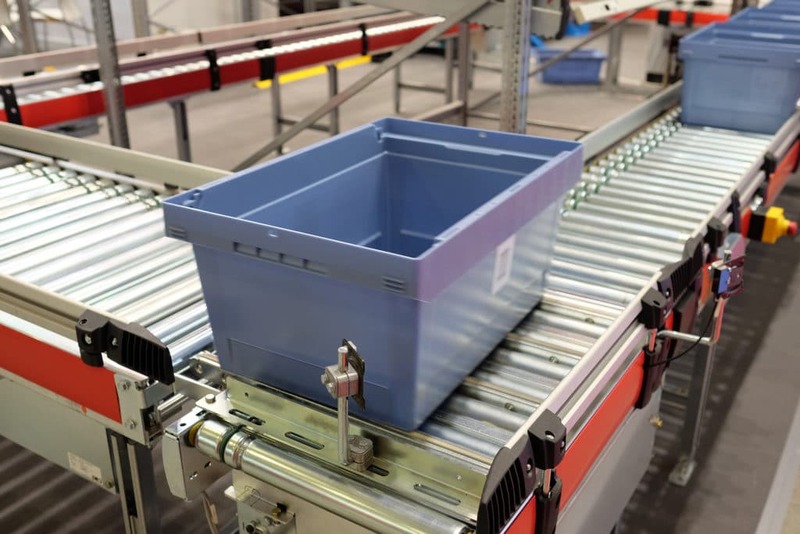 Cross-belt sorters are high speed loop sorters that utilize a series of small individual belted trays which are activated when an item needs to divert off of one conveyor onto another at a 90-degree angle. The configuration of the cross belt sorter can either be in a straight line or in a loop. These sorters can process from 60-500 parts per minute. Cross-belt sorters are ideal for transporting totes, containers, and bins as well as items that are difficult to sort such as pharmaceuticals, cosmetics, and electronics. DO YOU NEED AN ACCUMULATION CONVEYOR? If you need a complete accumulation conveyor system, we can help. We've been creating accumulation conveyor systems for more than 50 years.